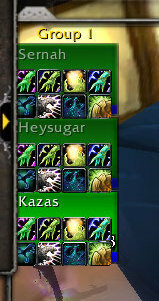 Here is a setup on the Blizzard default raid frames. It isn't pretty but it works. First I turned on Interface -> RaidFrames -> "Keep Groups Together"
Since we can not separate the frames at all, in order to put buttons next to them, we must put buttons on TOP of the frame. You notice I use _CleanseSpirit, this is so we can use debuffblink, which will make that button blink when a Curse or Magic debuff is present. We have to use this since our xubs cover up the buffs/debuffs on our frames. Make the frame big enough to hold your buttons, and a little extra space to easily see the health.